The eastern redbud (Cercis Canadensis) is a small tree which is frequently planted for use as a showy ornamental shrub in the landscape. 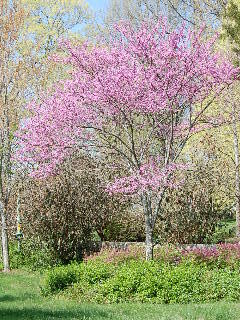 Although it can reach heights up to 40 feet and more, the redbud tree is desirable for its attractive pinkish red to lavender colored flowers and the appealing look of its heart shaped leaves, rather than as a shade tree. The leaves are dark green and somewhat pointed, turning yellow in the fall. The trees are sometimes planted in groupings or along streets and sidewalks in municipal settings. The tree will grow well in full sun or partial shade and is not very demanding of soil types, making it a good choice for the homeowner seeking something a little different in his landscaping plan. Container-grown redbud trees are usually easy to find at your local garden center and are relatively inexpensive to purchase. The bark of the tree ranges in coloration from gray to almost black and is very smooth on younger trees, becoming somewhat scaly on the trunks of older trees. The wood of the redbud is heavy and hard although not very strong. The trees sometimes have a tendency to develop hollowness and decay in the main trunk as they age, making them less than perfect in appearance or uniquely attractive, depending on how you see things! The eastern redbud is a member of the legume family (Leguminosae), which contains about 13,000 species of herbs, vines, shrubs, and trees found worldwide. All of these plants produce a legume, or pod, of some sort. Beans, peas, and peanuts are examples of economically important legume crops. The nitrogen-fixing bacteria in the root nodules of the legumes help to enrich the soil. The pinkish-brown pods on the eastern redbud tree are about 3 inches long and usually contain several seeds. 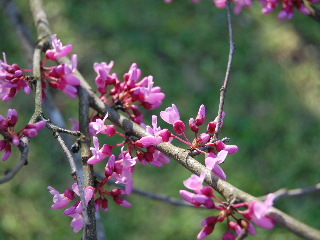 The eastern redbud is found widely distributed throughout the eastern United States, from the northern to the southern part of the country. Try adding one to your landscape and enjoy the colorful lavender blossoms in the springtime, the dark green heart shaped leaves in the summer, and the graceful rounded form of the entire tree all through the year.